When you ask yourself who had the power, the technical knowledge, who has agents in the Pentagon, who shipped off the WTC metal to China before any forensic investigation, who controls the courts to ensure that no Jew suspects and Zionist companies would be brought to trial, who had hacked into the USA telephone network, who controlled the airports that the alleged hijackers boarded, who bought the asbestos filled Twin Towers weeks before the 9/11 False Flag and made sure they were insured for a terrorist attack and who is benefiting from these endless ME and African wars, one and only one nation fits the profile, Israel. 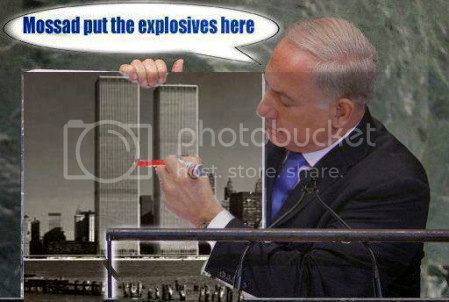 Israeli and American Jews were the only ones arrested on 9/11 for suspicious activity, like recording the attack and celebrating the destruction of the WTC. Possibly the best 9/11 truth site out there, with page after page, after page of American and Israeli Jews fingerprints all over the 9/11 attack. The following video is one Israel and her rabid supporters don't want you to see. So when the Pentagon war mongers set off a shooting war with China, the American pilots who get shot down, will be thanks to the Israeli back-stabbing of selling our technology to China. WTC janitor William Rodriguez was working in the basement area of the North Tower when he hears a large explosion from the floors below him seconds before the first plane crashes into the top of the building, rescues a fellow worker who is severely burnt from the blast below, and also hears various explosions from the 20th trough the 30th floors included the 34th floor which was completely empty due to a "construction project". i wonder what happened to the producer, the reporters and directors of this video. Hans, they're probably looking for work or maybe they're worm food.